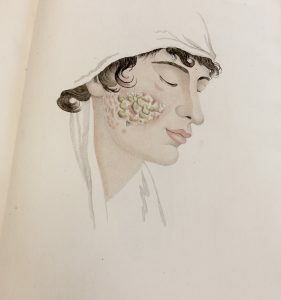 Clinique de L’Hopital Saint-Louis, de Traite Complet Des Maladies de la Peau, 1833. Unfortunately some evidence of water damage is visible, possibly from the 1907 fire. France’s first dermatologist, Jean-Louis Alibert (1768-1837), was professor and chief-surgeon at Saint-Louis Hospital in Paris. 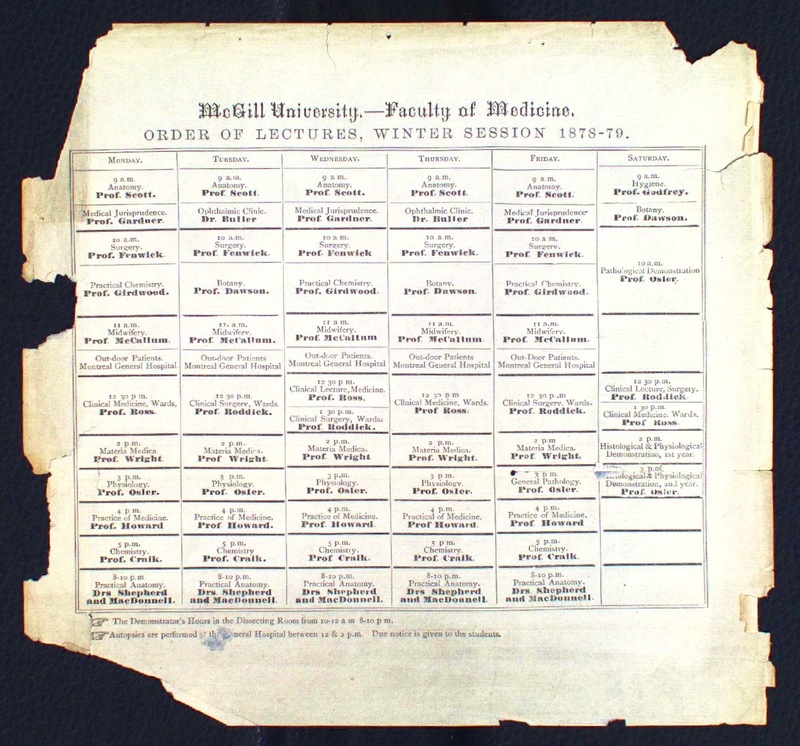 His medical achievements and reputation as a great teacher of hospital clinics put him in the company of other influential nineteenth century physicians, collectively known as the Paris School. 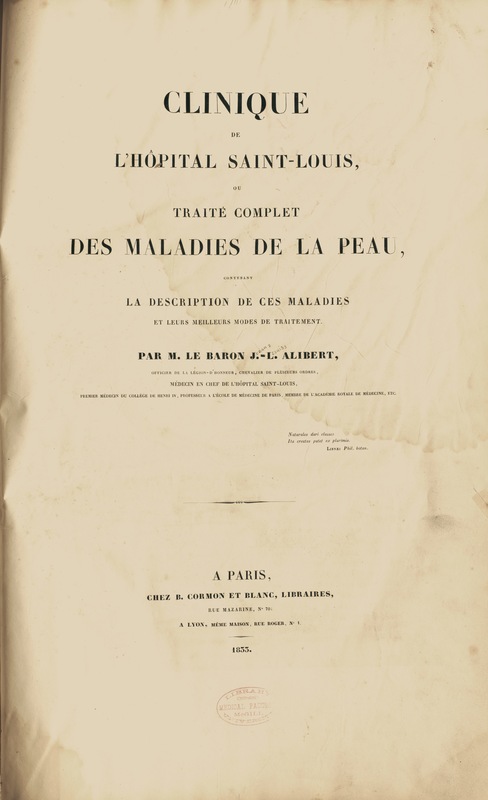 Osler Library’s rare book collection houses approximately a dozen titles of Alibert’s prolific work, including three copies of his second atlas entitled Clinique de L’Hôpital Saint-Louis, de Traite Complet Des Maladies de la Peau – two 1833 French copies, and an 1835 Italian translation. The atlas is an impressive work from both a medical and an artistic standpoint. 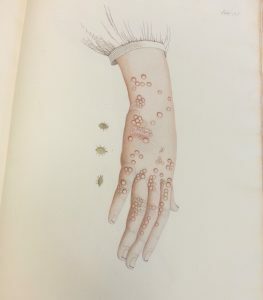 It includes 63 hand coloured plates, including the botanically-inspired “Arbe des Dermatoses” (“Tree of Dermatology”). 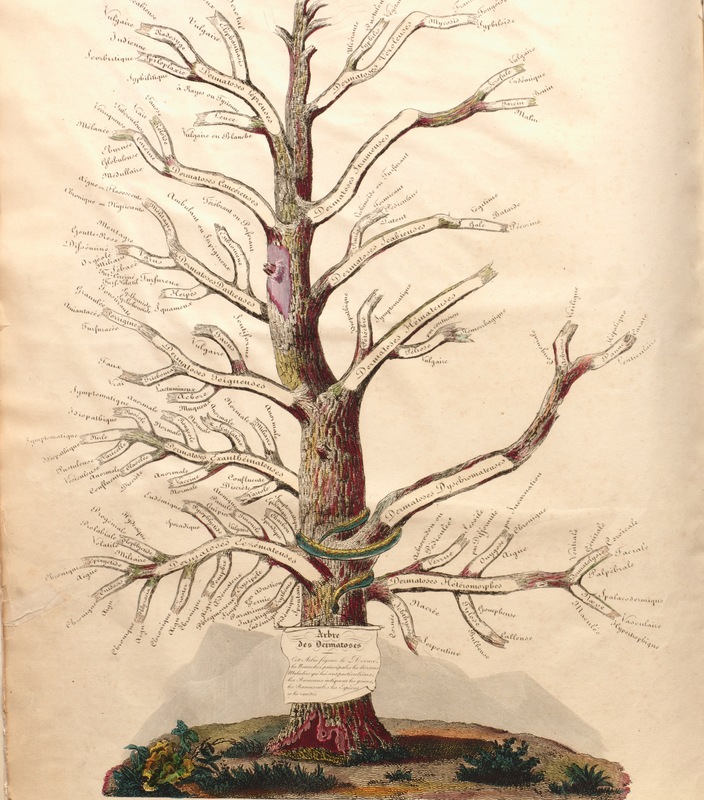 “Arbre des Dermatoses” (“Tree of Dermatosis”) shows Alibert’s method to visually classify common skin diseases and disorders with twelve main branches, each representing a class of dermatosis. 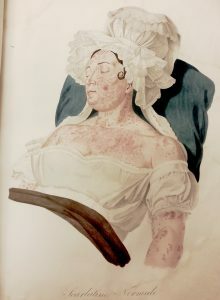 Similar to other areas of science, medical research and the practice of medicine experienced rapid progression after the French Revolution (1789-1799). Newly implemented ideological and institutional reforms allowed physicians to focus on the greater health of the whole community, allowing for the opening of clinics for the general public. It was the dawning of the “medical gaze“ – a term coined by Michel Foucault in his 1963 book The Birth of the Clinic: An Archaeology of Medical Perception. Alibert’s clinical lessons became well-known and attracted students and physicians alike to l’Hôpital Saint-Louis. 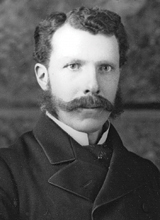 Over the course of his career, Alibert was able to make important contributions to descriptions including lupus vulgaris, keloid, dermatolysis, mycosis fungoides, and cutaneous leishmaniasisis. He is also credited with several first descriptions – among them Mycosis fungoides (shown below). 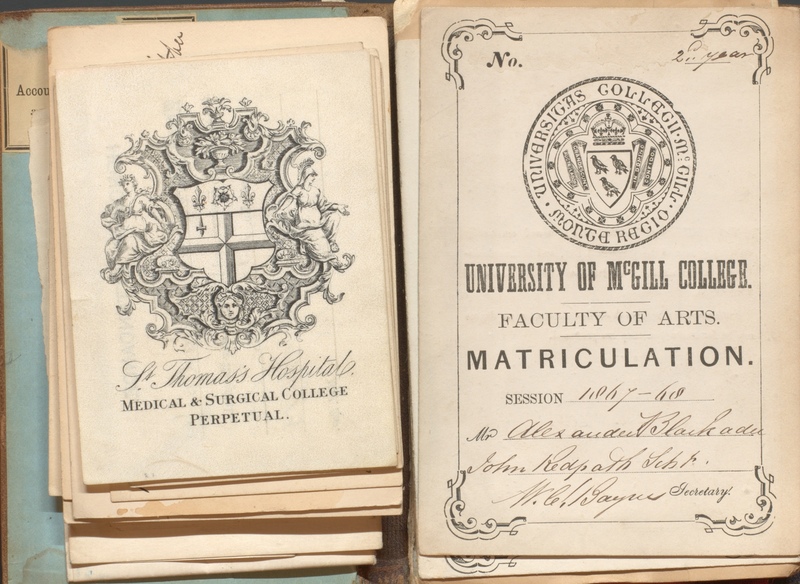 This book and others by Alibert are available to view in the Osler Library’s pre-1840 room during regular opening hours. Pl. 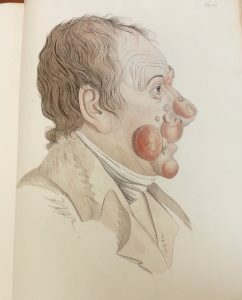 50 “Mycosis fungoides”, first called Pian fungoides, 1833. Pl. 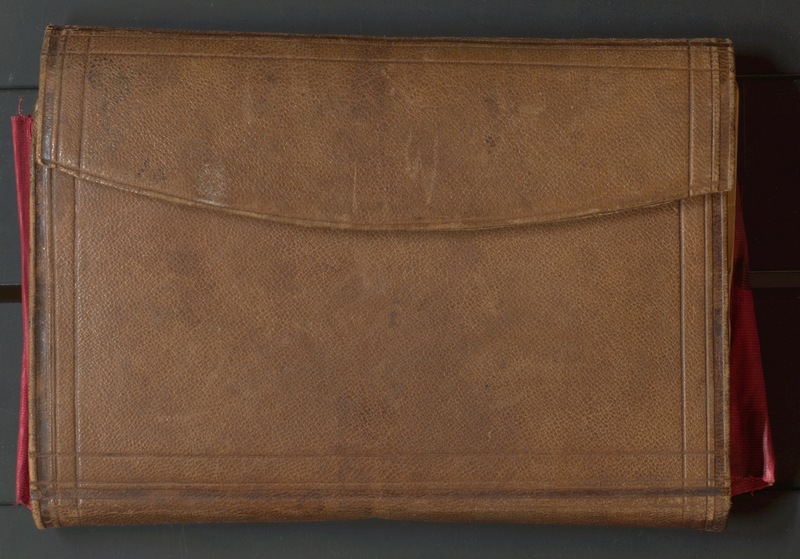 12 “Scarlatine Normale”, 1833. Pl. 31 “Mélitagre aigue ou flavescente”, 1833. Pl. 55 “Gale légitime, ou vésiculeuse”, Scabies, 1833.